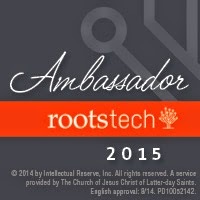 As many of my readers will be aware, I shall be attending my first ever RootsTech 2013 conference in Salt Lake City next month (from 21-23 March). In fact, this will be my first visit to this city, which is rich in genealogical history due to the presence of the world-renowned Family History Library run by the Church of Latter Day Saints. For those of you who have been following me on Twitter or London Roots Research on Facebook, you may also know that I have been invited to be an Official Blogger for RootsTech 2013. I intend to blog about RootsTech 2013 from a UK perspective, both while I am there, and possibly after I am back home. I will be blogging about it here on my London Roots Research blog. My aim is to summarise the most interesting parts of the event, from the point of view of the UK genealogist, amateur or professional. I also hope to interview some of the UK genealogists attending RootsTech 2013 as I believe that this year there will be a larger UK contingent than in previous years. Finally, if anyone reading this would like to attend RootsTech 2013 but hasn't bought a ticket yet, the Early Bird pricing for the 3-day passes expires this Friday, 15th February. You could save $70 on the full 3-day pass if you're quick! Can't wait to see you at RootsTech Rosemary! Can you "register" with the GeneaBloggers group so we can have you properly outfitted in blogger beads and get you invited to all the best blogger events? See http://geneabloggers.com/geneabloggers-members-rootstech-2013/ and scroll to the bottom of the page. Thanks Thomas, I have now registered on this site as a blogger. I look forward to meeting you too. Another Strathclyde graduate makes it to RootsTech! I had a great time last year and am sad I can't go again this year. Enjoy the Aladin's cave called the Family History Library. Thanks Sue. Look forward to catching up at WDYTYA? Live. I can't wait to meet you at RootsTech! Love your blog! Thanks Heather and I'm glad you like my blog.